ST. PETERSBURG, Fla. (March 19, 2018) — If Saturday’s season-opening win over North Carolina FC didn’t give the Tampa Bay Rowdies an energy boost heading into Saturday’s home opener, then Monday’s official season kickoff party surely did the job on a great evening in St. Petersburg. Rowdies players and coaches were joined by more than 1,000 fans at the Mahaffey Theater to formally welcome the 2018 season. Fox Sports soccer host and Rowdies fan Rob Stone hosted the evening. Stone moderated a Q&A session with Rowdies captain Joe Cole, Georgi Hristov and Marcel Schäfer, as well as Chairman and CEO Bill Edwards, before the 2018 roster was introduced in front of a raucous crowd. 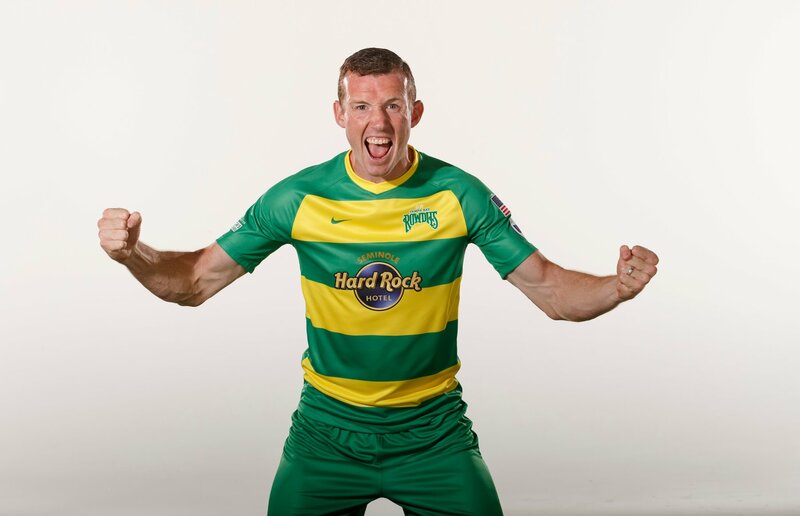 The Rowdies launched three brand new Nike kits for the 2018 season, including two variations of the hooped jersey that has become synonymous with the club in recent seasons, one that is primarily gold, which the team wore in Saturday’s win, and one which is primarily green. Also launched was a classy white alternate kit featuring broad green hoops across the chest and gold detailing. All three uniforms feature the Seminole Hard Rock Hotel logo across the chest and a Visit St. Petersburg Clearwater logo on the sleeve. The Rowdies get back on the practice field Tuesday morning to continue preparations for what promises to be an exciting home opener against the Bethlehem Steel on Saturday night at Al Lang Stadium.